Since the Soviet Union’s collapse, the Chinese People’s Liberation Army (PLA) has been a leading client for high-end Russian military hardware. Such imports played a key role in revolutionizing China’s aerial warfare capabilities, in particular during the 1990s with acquisition of the most capable Russian air defense systems, air-to-air missiles and air superiority fighters available. While China at the time retained a negligible domestic military aviation industry, which was more than a generation behind its Russian and U.S. counterparts, heavy investments in research and development and a good deal of reverse engineering over 20 years meant that by the 2010s the PLA’s reliance on high-end Russian equipment was reduced considerably. The future of Russian arms exports to the country, a vital source of revenue for Russia’s defense sector, has thus been brought to serious question on repeated occasions — perhaps best epitomized by Russia’s inability to market more than two dozen of its latest Su-35 fighter jets to the PLA in 2015, an offer which had to be accompanied by generous technology transfers to be accepted. Given this, the highly optimistic recent statement pertaining to prospects for future Russian fighter sales to the PLA by Viktor Kladov, the director for international cooperation and regional policy of Rostec, the Russian state conglomerate for arms exports, were thus cause for considerable surprise. Upon announcing plans for the export of Russia’s Su-57 fifth generation air superiority fighter at the 2019 Langkawi International Maritime and Aerospace Exhibition (LIMA) in Malaysia, Kladov elaborated on the new platform’s leading potential export destinations. While focusing particularly heavily on the possibility for exports to the Middle East, in light of recent reports that the export variant of the aircraft would be unveiled for the first time at the Dubai Airshow in November 2019, Kladov also noted that other export clients were expected to emerge in South Asia and the Asia-Pacific. Alongside marketing of the aircraft to India, and unverified reports of Vietnamese interest in an acquisition, China’s People’s Liberation Army Air Force was, according to Kladov, also a possible client for the aircraft. The director stated in regards to a potential acquisition by the PLA Air Force: “China has recently taken delivery of 24 Su-35 aircraft, and in the next two years will make a decision to either procure additional Su-35s, build the Su-35 within China, or to buy a fifth-generation fighter aircraft. This could be another opportunity for the Su-57E.” Kladov thus indicated that the PLA was not only potentially interested in the fifth generation Su-57, but also in further purchases of the older “4++ generation” Su-35. His statement raised a number of questions regarding the PLA’s plans for modernization of its aerial warfare capabilities, given that China was believed to have superseded Russian military aviation technologies in a number of key fields based on the specifications of its latest combat jets. This perception was strongly reinforced by the PLA’s induction of its own fifth generation air superiority fighter the Chengdu J-20 in 2017, which preceded the entry of the Su-57 into service and marked the first aircraft of its generation to complete development outside the United States. China also preceded Russia in its deployment of aircraft with active electronically scanned array radars, which are currently mounted on its J-20 and J-10C fighters, as well as its deployment of next generation air-to-air munitions with the entry into service of the PL-15, to name but three leading examples. While the Su-35 did field a number of technologies that China’s own defense sector had yet to develop, including three-dimensional thrust vectoring AL-41F-1S engines, these technologies are expected to have been mastered by Chinese military aviation by 2022 and deployed on the upcoming J-11D — China’s own “4++ generation” air superiority fighter, which is predicted to match if not supersede the Su-35’s capabilities. Should the J-11D program succeed, China would have little reason to purchase further Su-35 aircraft or to seek to establish production of the platform domestically as director Kladov suggested. An assessment of the capabilities of the more advanced Su-57 however, many of them highly unique, indicates that could provide the PLA with a more valuable asset — one capable of fulfilling a complementary role to the indigenous J-20. While the J-20 lacks three- or even two-dimensional thrust vectoring at present, the Su-57 retains them in their most advanced form yet and is considered the most maneuverable fighter ever developed. Unlike the J-20, the aircraft is ideally suited to dominating the skies in medium- and short-range engagements. The fighter’s internal weapons payload is also much larger than that of the J-20, deploying eight long range K-77 or R-37 long range air-to-air missiles. That also gives the Su-57 a considerably longer air-to-air engagement range compared to the J-20, with the K-77 missile retaining a range of over 193 kilomters with unique active phased array antenna (APAA) technologies. The Su-57’s internal missile bays can also deploy the specialized R-37 with a 400 km range — designed specifically to target tankers, airborne warning and control systems (AWACS), and other vital support systems. The fighter is also set to deploy a number of enhanced air-to-ground munitions, including Drel guided stealth bombs and Kh-47M2 hypersonic ballistic missiles. Directional Infrared Countermeasures Systems on the Su-57 also allow it to fire modulated laser beams at incoming missiles’ seekers to blind them. These are all capabilities that existing Chinese fighters, including the J-20, lack entirely. The Su-57 certainly cannot be said to outclass the J-20 across the spectrum, with the Chinese jet integrating a number of high-end technologies its Russian analogue lacks, including a more sophisticated radar cross section reducing stealth profile, a Distributed Aperture System and a Universal Water Activated Release System. However, the fact that the Su-57 integrates several critical technologies the J-20 lacks makes it a potentially attractive aircraft for the PLA. Each aircraft’s strengths represent the technological fields in which its respective country is strongest, and by fielding both fifth generation platforms the PLA can better position itself to dominate the skies in future battles. Based on an assessment of the state of Chinese military aviation and the capabilities of Russia’s two leading fighter jets, it can be concluded that while prospects for additional Su-35 purchases remain slim, PLA acquisition of the Su-57 cannot be ruled out even with the indigenous J-20 already in production on a far larger scale. Development of a specialized aircraft carrier-based variant of the Su-57, and of sixth generation technological enhancements such as integrated laser weapons and artificial intelligence, are reportedly currently in progress and are set to strengthen the platform’s attractiveness. This is particularly true given China’s rapid expansion of its carrier fleet and the J-20’s reported unsuitability for development into a carrier variant. Perhaps most importantly of all however, the purchase of Su-57 fighters could also pave the way for considerable technology transfers allowing the PLA Air Force to acquire key next generation technologies to apply to its indigenous fighter designs – potentially including future J-20 variants. There is a strong precedent for such transfers based on the contracts under which the PLA acquired Russian fourth generation aircraft. Should the Russian military follow through on its announced plans to integrate sixth generation technologies onto the Su-57, which have been tested on its airframe in the past, the fighter’s attractiveness to the PLA would only increase. The opportunity to acquire these technologies is particularly valuable given the growing perceived threat posed by the United States’ development of sixth generation air superiority fighters of its own, which are expected to enter service by 2030 and be heavily tailored to the operational requirements of the Pacific theatre. 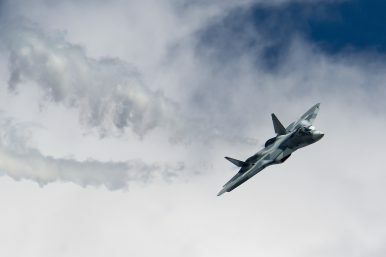 While the possibility of a Russian sale of further high-end fighter aircraft to China has previously been dismissed by both Western and Chinese sources, the value of acquiring Russian technologies developed for the Su-57, and the platform’s unique capabilities, could well make such a sale possible. Abraham Ait is military analyst and expert on Asia-Pacific security, as well as the founder of Military Watch Magazine.